On Wednesday, November 14, at 7:30 pm, faculty artist Alexander Fiterstein, clarinet, will present a recital titled “Music in a Time of War.” Fiterstein will perform Mieczysław Weinberg’s Sonata for Clarinet and Piano, Op. 28 with guest artist Michael Brown, piano. Then guest artists Elena Urioste, violin, and Nicholas Canellakis, cello, will join them for Olivier Messiaen’s Quatuor pour la fin du temps (Quartet for the End of Time). This concert, in Miriam A. Friedberg Concert Hall, will be free. Reserve advance tickets online or by calling the box office at 667-208-6620. Iyun Ashani Harrison, the artistic director/founder of the resident dance company at Goucher College, presented a free master class in B29 in Peabody’s Austrian Hall. 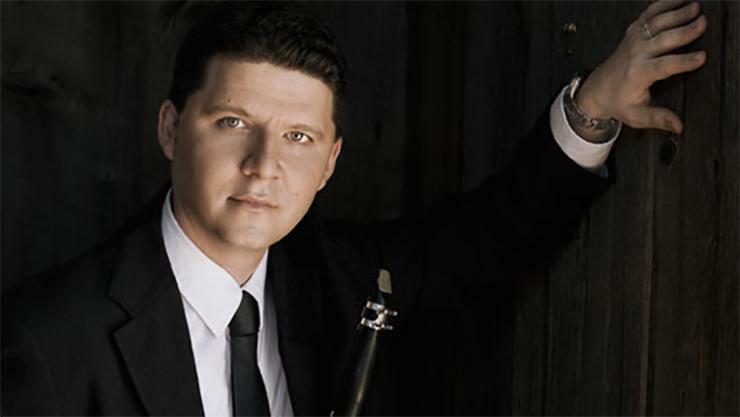 Clarinetist Sean Osborn, a former member of the Metropolitan Opera Orchestra, will present a free master class in Leith Symington Griswold Hall. Chadwick Thomas, clarinet, will perform Sergei Prokofiev’s Sonata for Clarinet and Piano, Op. 94. Yu Wang, clarinet, will perform Louis Cahuzac’s Arlequin. Clarinetists Chadwick Thomas, Jay Shankar, Andrew Im, and Sheng Chen will perform opera excerpts. Andrew W. Mellon Chair in Piano Leon Fleisher will present a free master class in Cohen-Davison Family Theatre. Ye Jin Lee, piano, and Eunchan Kim, piano, will perform Beethoven’s Piano Concerto No. 4 in G major, Op. 58. Ethan Sandman, cello, and Randy Ryan, piano, will perform Beethoven’s Sonata No. 4 for Cello and Piano, Op. 102, No. 1. Dancer and choreographer Florian Rouiller will present a free ballet master class in Room B29 in Peabody’s Austrian Hall. Jason Vieaux, guitar, will present “Outside the Music: How Freelancing Skills Beat the Competition,” a free lecture in the Centre Street Performance Studio. Vieaux will also present a free master class in Centre Street Performance Studio. Felipe Garibaldi, guitar, will perform Cláudio Santoro’s Two Preludes and Etude. Jordan Colquitt, guitar, will perform Thelonious Monk’s Round Midnight. Zachary Grim, guitar, will perform Richard Rodney Bennett’s Impromptus. Benjamin Gascon, guitar, will perform Mauro Giuliani’s Theme and Variations, Op 105. Sojourner McClure, guitar, will perform Antonio Lauro’s Preludio and Danza Negra. Famed violinist Pamela Frank and pianist Stephen Prutsman, a Peabody alumnus, will perform a special recital in honor of Leon Fleisher’s 90th birthday in Leith Symington Griswold Hall. The duo will perform Bach’s Sonata in E major, BWV 1016, for Violin and Keyboard and Brahms’ Sonata No. 1 in G major, Op. 78. Tickets are currently unavailable; please call the Box Office at 667-208-6620 to be added to the waiting list. Now on Fridays, at 12:30 pm, this week's free recital in Leith Symington Griswold Hall will be presented by the Piano Department. Sahun Hong, piano, will perform four movements from Robert Schumann’s Fantasiestücke, Op. 12. Eugene Chan, piano, will perform Sergei Rachmaninov’s Italian Polka and one movement from Rachmaninov’s Sonata in G minor for violoncello and piano, Op. 19. Min Joo Yi, piano, will perform Sergei Lyapunov’s Transcendental Étude No. 10 in B minor, Op. 11, “Lezghinka,” and one movement from Pyotr Ilyich Tchaikovsky’s The Nutcracker Suite. Yi Chen Feng, piano, will perform three movements from Sergei Rachmaninov’s Moment musicaux, Op. 16. Laura Kaminsky’s As One is a chamber opera in which two voices—Hannah after and Hannah before— share the part of a sole transgender protagonist in a poignant coming-of-age story with a universal theme of identity, authenticity, and compassion. This Peabody Opera Outreach production with JoAnn Kulesza as music director and James Harp as stage director features soprano Colleen McGonigle and baritone Rahze Cheatham. Performed in honor of Transgender Awareness month, the shows will take place at The Motor House, 120 West North Avenue, Baltimore. Tickets are $20 and $10 with valid student ID and are available at motorhousebaltimore.com. Thierry Mechler, organ, will present a free "Improvisation Workshop" master class in Leith Symington Griswold Hall with performers Dalaie Choi, Jordan Prescott, and Glenn Osborne. Conservatory faculty artist Boris Slutsky, piano, will present a free master class with Preparatory piano students in Hilda and Douglas Goodwin Recital Hall. HeeJee Lee, piano, will perform Bach’s Prelude and Fugue in B-flat major, BWV 866. Jaeman Shin, piano, will perform Beethoven’s Piano Sonata in G minor, Op. 49, No. 1. Alan Mao, piano, will perform Beethoven’s Piano Concerto No. 1 in C major, Op. 15. The Short Notice Brass Ensemble – Todd Oehler, Vladimir Castillo, trumpets; Chris Frick, French horn; Nick Bulgarino, trombone; and Jahi Alexander, bass trombone – will perform in the free Peabody at the Pratt Library Series at the Waverly branch, 400 E 33rd St, Baltimore. Nicholas Hersh will guest conduct the Peabody Studio Orchestra in a performance of Sergei Prokofiev’s Suite from Lieutenant Kijé, Op. 60, and a showing of the Charlie Chaplin film A Dog’s Life to live orchestral accompaniment. This concert, in Miriam A. Friedberg Concert Hall, will be free. Reserve advance tickets online or by calling the box office at 667-208-6620. Faculty of the Peabody Preparatory will present a recital in Leith Symington Griswold Hall. Sean Brennan, guitar, will perform Ingram Marshall’s Soe-pa, Leo Brouwer’s Cantilena de los bosques and An Idea, "Passacaglia for Eli," and Andrew Norman’s Sabina. James Keretses and Isaac Greene, guitars, will perform Alexander Tansman’s Sonatine, Kirk-Evan Billet’s Qirillayan, Cody Criswell’s The Birth of Venus, and Sergio Assad’s Tres Cenas Brasileiras. The event is free and open to the public. This first of a four-concert series titled “The Art of Prelude and Fugue,” which will feature Lura Johnson, piano, presenting Bach’s complete Well-Tempered Clavier, Books I and II, interspersed with the complete Shostakovich Preludes and Fugues, Op. 87. Music theory faculty member Mark Janello will give a pre-concert lecture titled “Baroque Counterpoint” at 6:30 pm. The events in Leith Symington Griswold Hall are free and open to the public. The full calendar of events at Peabody, including all Conservatory student recitals, can be found at peabody.jhu.edu/events. For other events featuring Peabody performers, please visit our Peabody Institute Concerts Facebook page. ONLY 70 TIX REMAIN FOR THIS GALA EVENT! “DETROIT ‘67” CONTINUES @ THE STRAND THEATER CO. REVIEWS ARE IN: “SWEAT” @ EVERYMAN IS A HIT!